Whether your company builds or distributes construction equipment, manufacturing equipment, medical devices, telecommunications products, HVAC components or any other type of machinery or heavy-duty equipment, it’s likely your product is subject to harsh environmental conditions. Clearly, your industrial labels must withstand those harsh conditions as well. You can be confident that the NFI Corp. industrial labels on your product will meet your demanding specifications and stand up to rugged environmental conditions. Trucks, boats, forklifts, and other transportation equipment – Industrial labels must stand up to extreme outdoor environments including saltwater immersion. Industrial and lab equipment – Industrial labels must endure exposure to corrosive chemicals and industrial solvents. Medical devices – Industrial labels must withstand the repetitive use of abrasive cleansers in hospitals and clinics. What Kind of Industrial Labels Are You Looking For? We Can Help! Our in-house team of engineering-based designers will listen to your needs and specifications, then apply a consultative approach to spec out your custom industrial labels. Our experts help you navigate the many choices regarding materials, substrates, inks, and adhesives. We pride ourselves on working with you to engineer the right construction to meet your long-term goals and ensure your industrial labels survive harsh environmental conditions. In fact, when you call us, we may mention our Design-to-Delivery quality system. This enterprise-wide system ensures a focus on quality at every step in the process. This means you get skilled design and prepress production, exceptional service, and reliable on-time delivery. Once your label is applied to your equipment, will it be susceptible to constant handling by operators? To harsh chemicals, cleansers, or solvents? To extreme environmental conditions? Thanks to our subsurface printing technique and high-quality materials, NFI Corp.’s plastic industrial labels won’t peel or crack. The design or verbiage won’t scrape off, fade, or disappear. These durable labels weather well, stick to a variety of surfaces, and go the distance. When it comes to industrial labels, long-lasting durability is a must. Period. At NFI Corp., we know your instruction label, safety sticker, or quality control tag must perform over the long haul – without fading, tearing, or peeling. That’s why we’ll engineer your custom industrial labels to meet your product’s specific needs and environmental conditions. Don’t be surprised if your custom industrial labels last as long as your equipment! Our engineering-based designers are an inquisitive bunch! When talking with you about the industrial labels you’ll need, they’ll ask plenty of questions – and with good reason. For example, the environmental conditions will directly impact the choice of materials for plastic labels: polyester versus polycarbonate. In addition, the application surface also plays an important role. In particular, the surface of application determines the type of adhesive needed. Is there low surface energy? Is it a powder-coated finish? Is the surface smooth (such as stainless steel) or is it textured? Each adhesive is perfect for certain surfaces – but not suitable for all surfaces. Our designers seek to clearly understand the label’s usage, so they can recommend the correct materials. Companies in every industry imaginable rely on NFI Corp. for all types of heavy-duty plastic labels including security labels, OSHA safety labels, high-temperature labels, and chemical-resistant labels. What is your application? Based on your needs and specifications, our engineering-based designers will select the materials and adhesive to ensure your custom industrial labels withstand extreme weather conditions – including direct sun and saltwater immersion – as well as abrasive cleansers, chemicals, and industrial solvents. Industrial labels work hard. They might communicate safety notices or operating instructions. The might have QR codes or barcodes for scanning, which facilitates manufacturing, inventory, and shipping. They might feature embossed, cut out, or textured areas to support the product’s usability. They might feature Braille or visual icons to convey vital notices. Depending on the type of material selected for your custom industrial label – and the label’s functionality – you can choose from a variety of gauges and finish textures including glossy, velvet, textured, matte, or brushed. Every industrial label has different functional requirements, which drive the specifications for materials, engineered adhesives, the overall design, and the final deliverable. Newsflash: Industrial labels don’t have to be rectangular! At NFI Corp., we have a library with thousands of dies to choose from, including a wide variety of round, oblong, square, and rectangular sizes as well as unique shapes. Or you can order your own custom die. Our design team will work with you to select or create a custom shape. 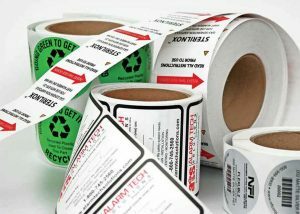 If you need a unique, custom design for your industrial labels, take advantage of our Prototype Program. You can order 10 pieces to verify the label’s shape and overall look-and-feel. This provides an opportunity to adhere the prototype label to your product or machine housing to ensure form, fit, and function. Backed by 40 years of craftsmanship, NFI Corp. is the global leader in the production of custom, high-performing graphic solutions. We are dedicated to crafting industrial labels that offer superior quality and high-performing durability. With NFI Corp.’s Prototype Program, you get rapid product development. This program is ideal for a quick turnaround of small runs to confirm form, fit and function. Call us at (800) 999-8900. Our customer service representatives are available Monday through Friday, 8:00 am to 5:00 pm Eastern, or CLICK HERE to contact us.